While not as draining as Blood Meridian, I did feel in need of something lighter and fluffier after finishing True Grit, and so I went to the same source as I did for the former novel. K-ON! is pretty much the apex of cute, funny shenanigans with a minimum of plot, so it seemed like the perfect thing to dip into to rest my brain a bit. With a new volume comes a new character. Azusa Nakano is an aspiring guitar player who decides to join the Pop Music Club after hearing a recording of the club's first concert. She is particularly keen to meet the lead guitarist of the group, as she was really inspired to meet a musician of such skill. How will she react when she sees how the group truly is? 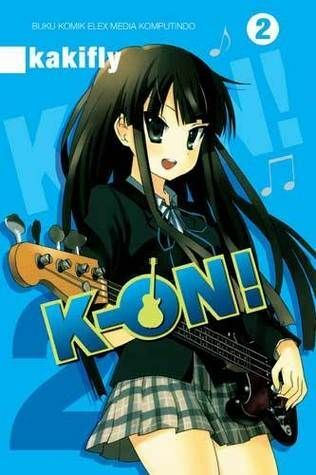 So the obvious thing to mention is that if you didn't like the first volume of K-ON! then there is little chance of you enjoying the second, because it's very much more of the same thing. There's jokes about how the club seems to be more an excuse to drink tea and eat cake. There's jokes about the teacher being less mature and weirder than she wants to be. And then there's Yui's weird propensity for either excelling or failing spectacularly depending on what it is that she's concentrating on at that point in time. It feels very comfortable, if that's what you're looking for. The main difference for this volume is the addition of Azusa, a first-year to the main group's second-years, and she feels like a definite breath of fresh air. She's kind of a nice foil to both Yui and Mio. With Yui there is a brewing rivalry of sorts, as while Yui is spacey and doesn't know the specific terms for musical techniques, she does have an uncanny ability to pick them up enviously quick. And with Mio, there seems to be more of a traditional senpai-kohai relationship, except that they're both so adorably dorky and awkward that it's an incredibly bumbling example of the relationship. Azusa's presence does also mean that there are a few more scenes that focus on them practising and performing, which is nice.